Hold that pencil just right! Printing practice can be fun for some and a challenge for others. These worksheets have plenty of dashed lines to help your kids practice the lines and curves of printed letters. In a traditional manuscript, these pages are sure to reinforce writing skills and letter identification. Some pages have charming graphics the kids can color in, too – even more small motor skills practice. Go to this page to choose from all the language arts resources on this site. What fun! Kindergarten printing practice pages that will delight you and your kids. These pages include four sets of uppercase and lowercase letters on individual pages as well as one set with the upper and lowercase letters on the same page. All the pages have primary writing lines so your kids can practice their neatest writing possible. Dashed lined letters give kids a chance to trace a few letters, then there’s lots of room for practice. 134 worksheets – 5 sets with 26-28 worksheets each. Here are some handy dandy handwriting practice worksheets. 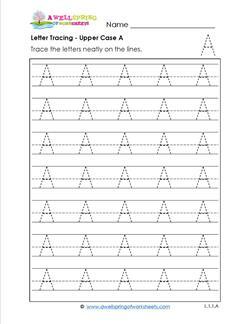 So far, there are some basic letter tracing worksheets that will be a great help for having kids get the formation of the letters down. You can have your kids practice a few letters on a white board first, remembering to write from top to bottom and left to right. Then have them move to these handwriting practice worksheets, writing neatly and carefully. As they say, practice makes perfect!